In a joint statement, Francis and the Catholic Patriarch of the Assyrian Church of the East note the progress on the path of unity and reiterate that "it is not possible to imagine the Middle East without Christians. This conviction is founded not simply on religious grounds, but also on social and cultural realities, since Christians, with other believers, greatly contribute to the specific identity of the region”. 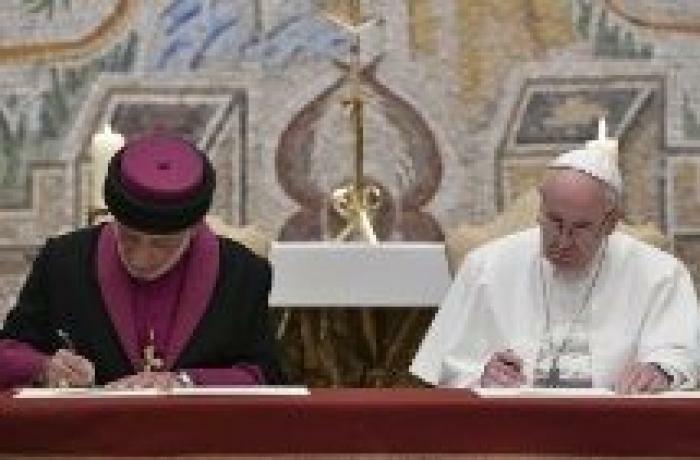 Vatican City (AsiaNews) – Pope Francis and Mar Gewargis III, the Catholicos Patriarch of the Assyrian Church of the East, signed a joint statement underlining the progress the two Churches have made on the path of unity. The declaration also stressed the primacy of the law, including respect for freedom of religion and equality before the law, based on the principle of citizenship, independent of ethnic origin or religion, as the bases on which to build peace in the Middle East, especially in Syria and Iraq. “Christians do not want to be considered a ‘protected minority’ or a tolerated group, but full citizens whose rights are guaranteed and defended, together with those of all other citizens. For Pope, the blood of Christians killed in Syria and Iraq is a "seed of unity"